Sally Tuffin is one of the UK’s leading pottery designers and works from her own studios, Dennis China Works in Somerset. The pottery uses traditional techniques and all pots are hand thrown, with decorating techniques that include incising, slip trailing, spinning and floating colour. Her work is highly prized with early and limited pieces fetching premiums. In the December 1999 Phillips auction, a Sally Tuffin Polar Bears footbath commissioned by Phillips for sale in its first ever Sally Tuffin auction made four times the estimate selling for £2,300. Since then prices for Sally Tuffin items have increased consistently. In December 2005 ‘March of the penguins’ was sold at Bonhams for £15,720 over six times its estimate which smashed the previous record for the Honey Bee Jar and Cover which sold for £11,500. Pictured: March of the Penguins – vase painted in pale blue/green designed to resemble an iceberg. March of the Penguins features no fewer than 40 individually modelled black and white birds edging their way down an ice flow, circling closer to the sea and then casting themselves adrift. Sold for £15,720 at Bonhams, December 2005. Sally Tuffin who once designed cutting edge clothes in Carnaby Street in the 1960’s for Pop Royalty such as Paul McCartney and the Beatles, now design pots that are acknowledged by experts to be stars in their own right. The Dennis Chinaworks was originally established in 1985 by Sally and her husband, Richard Dennis, but Sally spent a few years as Art Director of the Moorcroft pottery before concentrating entirely on her own work. Since 1993, the Dennis Chinaworks has thrived in the converted stables of a Victorian rectory in Somerset where Tuffin and her team of young craftsmen and women make distinctive hand-thrown and decorated art pottery. 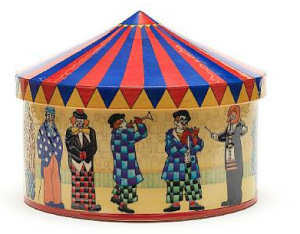 Pictured: ‘Circus with Clowns Big Top’ a box and cover, 2008 Painted with a parade of clowns including representations of Porto, Rudolf Seiffert, Louise Maïss, Polo Rivel, Bibi, ‘Whimmy’ Walker, Doodles, Grimaldi and Grock 23cm high, 28cm diam, with Dennis Chinaworks mark, and painted ‘S.T des’ dated 2008, with thrower’s monogram for Rory McLeod and paintress’s monogram for Heidi Warr, marked B136. Sold for £13,200 at Bonhams 23 Sptember 2008.
company for childrens’ mail order clothes called Tuppence Coloured. was the Designer and Art Director at Moorcroft Pottery until 1992 and among her most famous ranges were Cluny, Penguins and Finches. In 1992 Sally and Richard left Moorcroft to set up Dennis China Works. From 1995-1998 Sally also designed for Poole Pottery and her range is still a bestseller particularly as it was chosen as one of the designs to be used on the tail fin of the controversial BA decision to decorate its aeroplanes with patterns other than the Union Jack. Note: This site is not affiliated with Sally Tuffin or Dennis China Works. 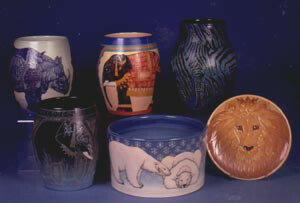 It is designed to provide information to collectors of Sally Tuffin Pottery.